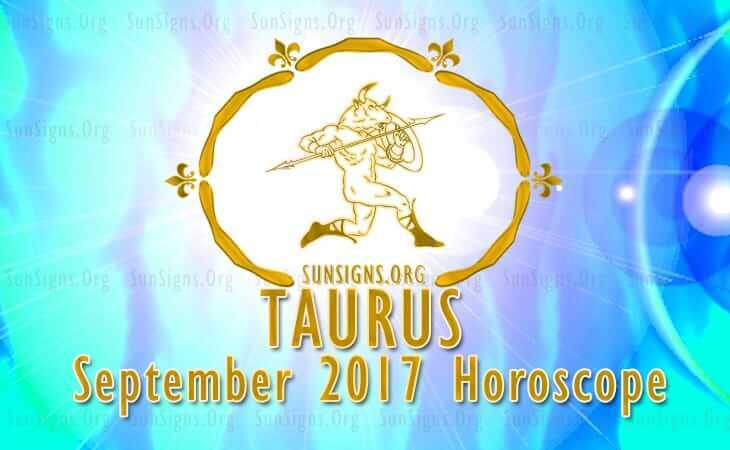 Taurus September 2017 Horoscope predicts that most of the planets are in the Southern half of the horoscope this month towards the midheaven sign. The House of Family is very powerful for the Taureans in September 2017. At the same time the House of Career is regressive. You can use this period for planning your professional goals and thinking about the methods to accomplish them in the future. Taurus, you should attend to your domestic problems and try to enhance your psychological strength in the month of September 2017. The Western half of the chart is becoming more dominant in September 2017 for the Taurus star sign. Hence others and their interests will take precedence over autonomy and strong deeds. While planet Mars is forcing you to be independent and aggressive, you should use your skills to overcome these traits if you have to succeed in life in September 2017. The 2017 astrology predictions forecast that Taurus career takes a back seat this month. Taureans seeking employment will be quite successful due to beneficial aspects of planets. This is also a good month to start a business but do not expect any immediate returns. The September 2017 horoscope for the Taurus personality forecasts that financially this is a wonderful month due to your hard work and financial imagination. Movement of Mercury in various Houses will ensure that money flows from different activities this month. In the first week of September 2017, money will be spent on family and money will come with the help of family members. After that till the 20th of September 2017, investments in risky ventures, health care and activities related to children will be beneficial. Till end of September 2017, the bulls can make money from fashion related ventures as well as fitness programs. The September 2017 monthly forecasts predict that planet Pluto is moving forward enhancing your romantic life in September 2017. Your social intelligence is quite powerful and allows you to take proper decisions in matters of love, relationships and pregnancy. Taurus, you will be using your personal allure to form new love partnerships and you will be highly successful. Planetary influences are favorable for repairing broken partnerships for the Taurus born in September 2017. Until the 21st of September 2017m the Taurean’s efforts to harmonize family relationships will be in focus. You will be successful in maintaining peace in family environment. There will be plenty of fun and enjoyment with family members. The Taurus health is very much better in September 2017 and can be further improved by attending to health problems. Have a glass of orange juice or a glass of lemon juice every day for better well being. Good fitness regime along with diet plans will add to your well-being. Read about Taurus fitness plans. The September 2017 Taurus horoscope predicts a month spent with family and planning your future career goals.